A Soyuz-Fregat rocket carrying the European Space Agency's galaxy-mapping Gaia probe launches from French Guiana on Dec. 19, 2013. A European probe roared into space Thursday (Dec. 19), kicking off an ambitious mission to map a billion Milky Way stars in high resolution. 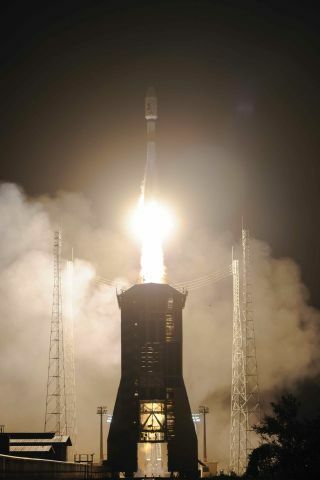 The European Space Agency's Gaia spacecraft lifted off its pad at Europe's spaceport in Kourou, French Guiana at 4:12 a.m. EST (0912 GMT) Thursday, carried aloft by a Russian Soyuz-Fregat rocket. Gaia is on its way to a gravitationally stable point about 930,000 miles (1.5 million kilometers) from Earth, which it should reach in about three weeks. As a side benefit, Gaia's powerful twin telescopes will likely find thousands of new exoplanets, asteroids and other small, faint and hard-to-see objects. ‪"Gaia will conduct the biggest cosmic census yet, charting the positions, motions and characteristics of a billion stars to create the most precise 3D map of our Milky Way," ESA officials said in a statement. Thursday's launch ended a long wait for the Gaia team, who saw the $1 billion (740 million euros) mission delayed from an initial 2011 launch due to telescope mirror issues, among other things. But there is more waiting yet to come, as Gaia still has a lot of ground to cover before reaching its ultimate destination, a spot called the sun-Earth Lagrange Point 2 (L2). Lagrange points are regions in space where gravitational and orbital interactions allow spacecraft to essentially park in one spot. And once at L2, Gaia will undergo a four-month commissioning period to make sure the spacecraft, its telescopes and other gear are working properly. Gaia also sports a sunshield, which has two purposes: To hold solar panels to generate electricity, and to be a barrier around Gaia's base against the heat of the sun. The spacecraft's instruments require a temperature of minus 166 degrees Fahrenheit (minus 110 degrees Celsius) to function. With the sunshield deployed, Gaia will stretch more than 33 feet (10 meters) across. Artist representation of the Gaia spacecraft mapping the stars in the Milky Way galaxy. During science operations, Gaia will spin to get a view of the entire sky. Images will be stored using a single digital camera that has almost 1 billion pixels of resolution, making it the largest digital camera ever to fly in space. Gaia is designed to be 100 times more accurate than Hipparcos, the last high-profile ESA star-mapping mission, which flew between 1989 and 1993. Hipparcos tracked down the locations of 100,000 stars precisely, and 1 million stars with less accuracy. Gaia's name originally stood for Global Astrometric Interferometer for Astrophysics, but the interferometer was dropped early in the mission design because astronomers felt they could get a better view of fainter stars with an optical telescope. The name remained for project continuity.